If you crew on other people’s boats you may well not have your own lifejacket. You will rely on the boat providing a lifejacket for you. 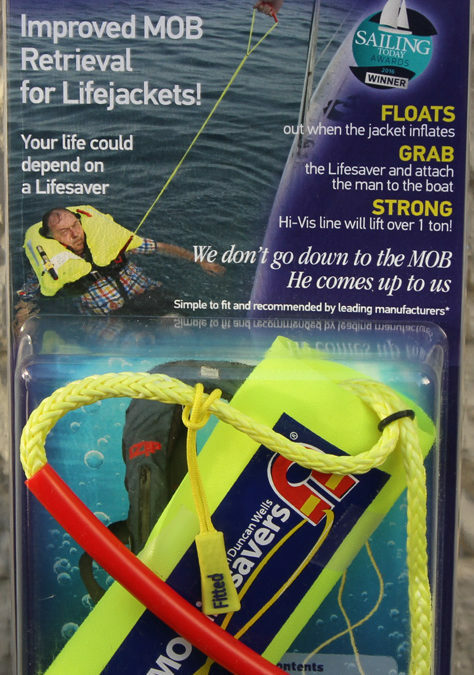 If the skipper is smart they will have MOB Lifesavers fitted to all their jackets. If they havn’t heard of Lifesavers yet they may not. But that doesn;t stop you having your own Lifesaver. Ask the owner’s permission for you ti fit a Lifesaver. Ideally you will fit it to the lifting becket in the lifejacket and it will be out of sight. Don’t forget to add a Lifesaver Fitted’ to let you know there is a Lifesaver on board. But you may want to make a temporary fit rather than disturb the neatly folded bladder in the lifejacket and so attaching the Lifesaver to a ‘D’ ring or to the harness works fine. You need to add it to a strong point on the lifejacket and the harness is just that. Do not add it to crotch or thigh straps as they are weak. Here are some examples of how we have added a Lifesaver to a jacket. Remember the best way to add the Lifesaver is to attach it to the lifting becket inside the jacket. Always makes sure that the Lifesaver is placed on top of the bladder in the jacket so that when the jacket deploys the Lifesaver will be pushed out onto the water where it will float.